Find your ideal property to rent or buy in Manchester with a little help from MOVEHUT. You could be searching for a new automotive based property, or even a serviced office in Manchester. No matter what size of commercial property you are looking for in Manchester, MOVEHUT has the features to make it easy. Whatever your requirements are, MOVEHUT is confident that we can make your property search in Manchester easier than you ever imagined. Manchester is a city in the North-West of England notable, among many things, for its industrial past and its influential music scene. Manchester has undergone extensive regeneration over recent years with many new cultural attractions and commercial properties dramatically changing the city's skyline. Today Manchester is widely regarded as having outstripped Birmingham to become the UKs second city. There are plenty of tips when it comes to looking for a commercial property to rent or buy in Manchester. Our tip number one would be to keep in mind hidden costs related to any property you're considering. If you plan to expand your business premises later on, you should consider whether the commercial property you are thinking of purchasing has the option to do this. When searching for a property in Manchester, just keep in mind some of our tips to help you make an informed decision. Commercial properties in Manchester fall under various different categories and types. We have an extensive range of commercial properties, from large warehouses and industrial buildings right down to offices and shops. We also provide listings for offices in Manchester, as well as meeting rooms and serviced offices. So don't worry - when it comes to property categories in Manchester, we have the variety to make your search a breeze. Buy a commercial property in Manchester with the help of our property listings. We can help your search in Manchester with our features and site functionality, which makes it really easy. If you need to make your search more specialised then you can narrow it down by postcode or search radius in Manchester. Why wait, get started with your property search today in Manchester. Manchester's history can be traced back to Roman times and beyond but fundamentally the city's historical significance is inextricably linked with cotton and the city's expansion during the industrial revolution. Cotton first began to arrive in Manchester in the early seventeenth century but it was not until around 150 years later that fabrics were produced on anything like a significant level. During the second half of the eighteenth century the Bridgewater Canal was opened. Later it was extended to the Mersey allowing Manchester to become the foremost textile market in the region. But it was in the nineteenth century that the trade really took off and as early as 1835 Manchester –dubbed warehouse city--was recognized as the first truly industrial city in the world. The Victorian era saw extensions to the canal system, the growth of engineering in the city and the opening of the first mainline railway station in the country. In 1878 the first telephones were installed in a Manchester commercial property and in 1894 the city became a port with the opening of the Manchester Ship Canal. On the banks of the ship canal the world's first industrial estate, Trafford Park, was opened, initially leasing land for development then building commercial property for rent. By the early twentieth century over 12,000 people were employed at Trafford Park in a variety of industries. Throughout the first half of the century Manchester was gradually outstripped as a cotton processor and the city was hit hard by the Depression of the 1930s. During the Second World War Manchester became a target for Luftwaffe bombers and during Christmas week 1940 a sustained bombing campaign killed over 350 people and damaged around 30,000 homes. In addition over 300 commercial properties including warehouses, offices and other business premises were either destroyed or seriously damaged. During the post-war years Manchester, along with many cities, suffered from the decline of heavy industry. It is estimated that between the early 1960s and the early 1980s Manchester lost 150,000 industrial jobs. Regeneration began with projects like the Bridgewater Hall and the MEN Arena and gathered pace as two Olympic bids raised the city's profile. Then, along with redevelopment planned for the 2002 Commonwealth Games, an unwelcome event led to the need for further rebuilding. On June 15 1996 the largest IRA bomb ever detonated on the mainland caused extensive damage to the city centre. Over 500,000 square feet of retail space and over 600,000 square feet of office space were affected by the bombing. 400 retail and business commercial properties were seriously damaged, many of which never reopened. The population of the city and boroughs comprising Greater Manchester is estimated to be around 2.55 million. The population of the city of Manchester itself is approaching half a million. 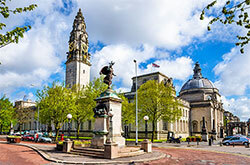 It is the fastest growing British city with a multicultural population. Since the decline of large scale manufacturing Manchester's economy is now largely service based. The city centre around Piccadilly and Deansgate has the largest concentration of office space outside London. This includes Spinningfields, a large commercial property development considered to be the Canary Wharf of the North, and Beetham Tower, the tallest skyscraper outside the capital. This serviced office space is largely occupied by the financial industries which is one of the major employers in the city. The sciences are also strongly represented in Manchester and there is a growing creative, cultural and media presence. Greater Manchester Local Education Authority (LEA) is responsible for education in the 10 Metropolitan Boroughs comprising the area. Manchester has two universities. The University of Manchester based on Oxford Road is one of the largest in the UK and has been ranked among the top ten universities in Europe. Manchester Metropolitan University is also based in the city and has outlying campuses in Crewe and Alsager. Two secondary schools of note are Manchester Grammar School, one of the oldest and largest independent schools for boys in the UK, and Manchester High School for Girls which was founded in the 19th century. Manchester has a long history of political protest and reform movements. The first Trades Union Congress (TUC) conference was held in the city in 1868. Manchester also features in the history of the Suffragette movement. Today Manchester City Council is a unitary authority with responsibility for the local government of the Greater Manchester area. Manchester is on the River Irwell bordered by the Pennines and the Cheshire Plain. Greater Manchester comprises 10 Metropolitan Boroughs. Besides the city and Salford the others are; Bolton, Bury, Oldham, Rochdale, Stockport, Tameside, Trafford and Wigan. Like the rest of the UK Manchester has a temperate climate with warm summers and cold winters. Contrary to popular myth it doesn't always rain in Manchester. 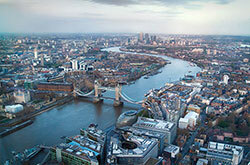 The city has an average annual rainfall of 806.6mm compared with a UK average of 1,125.0mm. Manchester's location makes it easily accessible by road and rail. The easiest method of getting around Manchester is the Metrolink. Opened in 1992, it is now the most extensive tram system in the UK. Manchester is served by Manchester Airport. It is the busiest airport outside London with flights to most major international destinations. The city is also well served by rail. Manchester Piccadilly and Victoria are the major city centre stations but there are many others throughout the Metropolitan Boroughs. Manchester has a long sporting tradition. Two world famous football clubs, Manchester United and Manchester City play in the city. For cricket fans Lancashire County Cricket Club is based at Old Trafford which also hosts Test Matches. Manchester has twice bid for the Olympics and hosted the Commonwealth Games in 2002. Manchester is a regional cultural centre. In addition there are attractions to suit every taste. Manchester is a major shopping destination which has undergone major redevelopment over recent decades resulting in both large scale retail commercial property developments and smaller units. One of the leading retail attractions is the Arndale Centre, the largest city centre shopping mall in the UK. Manchester is also home to the popular Trafford Centre. More recent retail commercial property developments include the Printworks and the Triangle. 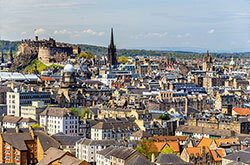 In addition the busy city centre is home to a host of famous retail names. When it comes to entertainment there is enough to choose from in Manchester to guarantee that no one will be disappointed. Manchester is home to Granada television the producer of popular soap opera Coronation Street. The BBC, which has always had a base in the city, has more recently moved more of its productions from London to Salford. The main newspaper is the Manchester Evening News which is handed out free of charge in the city centre on some days of the week. Manchester is famous for its pop/indie music scene. The city has produced some of the most influential pop music groups of the late twentieth century including the Smiths, the Stone Roses and Oasis. The main pop music venue in the city is the 21,000 seat MEN Arena, one of the largest in Europe. Manchester has two symphony orchestras, the Hallé and the BBC Philharmonic. The major venue for classical music in the city is the Bridgewater Hall with a capacity of 2,500. In common with other cities in Northern England, Manchester has a long tradition of Brass Bands. Major theatres in Manchester include the Palace Theatre, the Royal Exchange and the Manchester Opera House. Manchester has a host of outstanding museums. These include the Manchester Museum, the Museum of Science and Industry, the Museum of Transport and the Imperial War Museum. Manchester Art Gallery has an excellent permanent collection including one of the best Pre-Raphaelite collections to be found anywhere. Salford Quays is home to a significant collection of work from internationally renowned local artist LS Lowry. There are also a number of galleries showing modern and contemporary art including the Whitworth, the Cornerhouse and the Urbis Centre.